Enables contact annealing and GaN substrate processing. Supports 6-inch wafers and enables activation and oxidation in vacuum (LP) environments/N2 load-lock atmospheres. Supports a wide range of wafer sizes up to 6 inches. An automatic wafer replacement mechanism provides cassette-to-cassette transfer. Vacuum support improves annealing characteristics. N2 load-lock support enables rapid turnaround time. 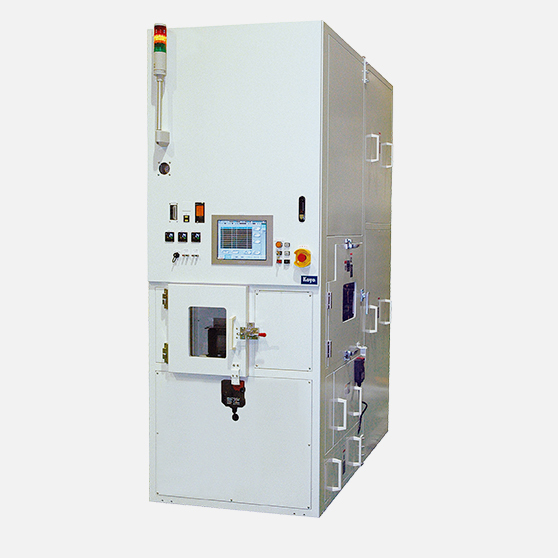 RLA-3100-V is a lamp annealing system that supports wafer sizes of up to 6 inches. A vacuum-resistant quartz tube enables processing in clean vacuum (LP) environments and N2 load-lock atmospheres. RLA-3100-V also enables GaN substrate processing.